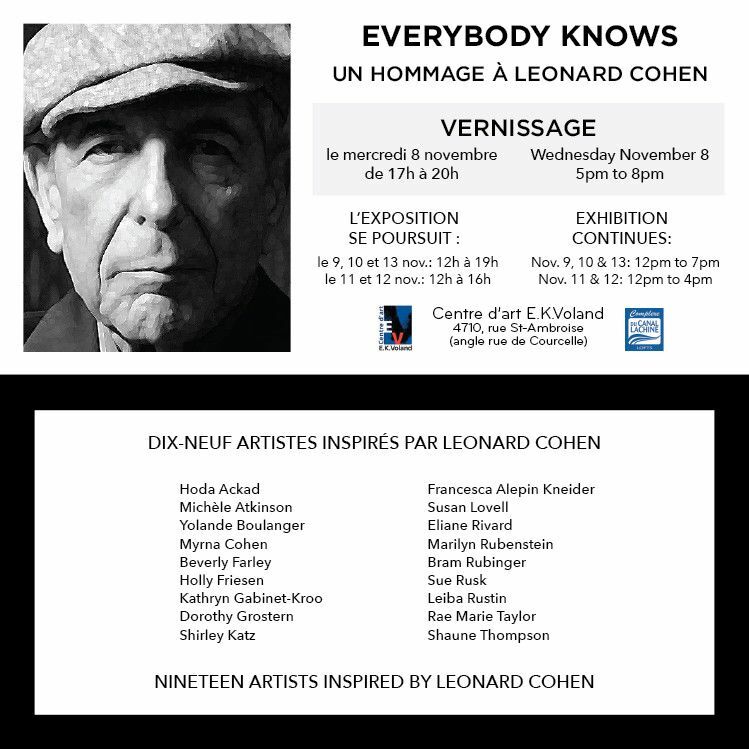 Vernissage: Wednesday Nov. 8, from 5 to 8 p.m.
"Everybody Knows: un hommage à Leonard Cohen" will be presented at the Complexe du Canal Lachine's Centre d'art E.K. Voland, 4710 St. Ambroise, from Wednesday, November 8 through Monday, November 13, 2017. The vernissage will be held on Wednesday, November 8 from 5 p.m. to 8 p.m. This exhibition includes work created by a community of 18 artists, each of whom has been inspired by the lyrics and poetry of Leonard Cohen, the renowned musician and writer from Montreal. Some exhibitors knew or met him when he was young and unknown, others followed his burgeoning career as a poet and songwriter, while still others fell in love with his songs without learning until much later that Cohen had penned them. All grew up with his special imagery, his work subtly impacting their own visual expressions. The exhibition, which coincides with the first anniversary of Leonard Cohen’s death, is thus a tribute to the man and to the influence he has had, and continues to have, on artists' lives and creative output. It encompasses a wide variety of styles and techniques, from more literal representations of his words to abstract interpretations of the feelings and memories stirred by Cohen's contribution to contemporary culture.